There is limited historic information about the Quoddy Bay. What we have learned is that the Quoddy Bay was registered in Vancouver, British Columbia, Canada in 1965 and was owned by Mattuna Fisheries Limited. The Seiner was transferred to the Port of St. Andrews, New Brunswick in November of 1965. The Quoddy Bay was reported to have burned and sank off Gloucester in 1969. The Quoddy Bay was discovered by divers aboard Gauntlet in June 2008. The wreck sites upright and intact in 215 fsw. 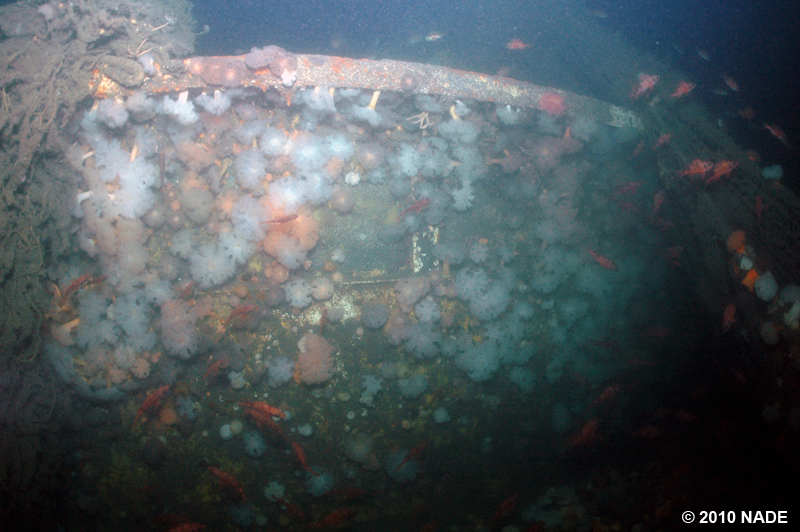 There is a large, derelict net on the bow, covering some of the port side in the bow area. The vessel has a number of ghost trawls and lines around the wheelhouse, but is otherwise relatively free of entanglements. Due to the small size and intact nature, the wreck is fairly easily navigated. The top of the wreck can be reached in about 190 fsw, with the bottom around 215 fsw. This is a unique and interesting wreck, particularly because it is so intact. The front glass windows of the wheelhouse are still intact.